Grundell’s detailed study of glitch art begins with a 1962 quote from the astronaut John Glenn: ‘A glitch is such a minute change in voltage that no fuse could protect against it’. A glitch occurring in a space shuttle could be catastrophic, an unprovoked error with life threatening consequences. With this simple observation, Glenn helped to popularise the concept of the glitch as an unseen flaw that only becomes visible when its fallout affects the functionality of a system. The digital revolution has since made the glitch, or more specifically the impact of the glitch, a more commonplace occurrence, such as those moments when a digital signal pixelates into an often beautiful abstraction or an interactive screen temporarily distorts before the familiar interface returns. The result of a glitch isn’t necessarily visual – as a creative concept it is closely associated with sonic effects – but when discussed as an aesthetic form, glitch art is usually found on a digital screen. Since 1999, when the Wachowskis released the first of their Matrix trilogy of films, the phrase ‘a glitch in the matrix’ has been used to encapsulate almost any situation where the anticipated flow of an experience becomes disrupted by some kind of friction. Grundell’s research explores this relationship between flow and friction, recognising the aesthetic of the glitch – whether deliberately constructed or encountered through chance – as a reflective moment: the viewer of an onscreen glitch is suddenly made aware of their interaction with a system because their expectations of that system have been subverted. 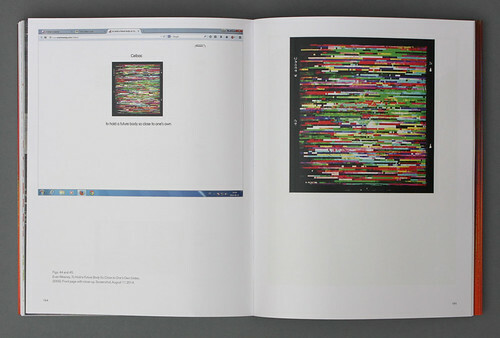 Spread showing Philip Stearns’s Year of the Glitch, 2012. In the work of Phillip Stearns, Rosa Menkman and Evan Meaney – the three glitch artists whose creative practice Grundell selectively explores in a series of case studies – the glitch can be understood through its tactical potential to make something invisible visible. In fact, as Grundell suggests, there are multiple types of visuality created by the digital glitch: its impact is visualised as an aesthetic form and it simultaneously makes visible some of the effects a system has upon its user by disrupting familiarity, reshaping engagement, and provoking bodily responses and interactions. By interrupting the usual flow and fluidity associated with an interface, glitches can provoke a heightened level of sensory awareness. In each of the three websites central to Grundell’s study – Stearns’s Year of the Glitch, Menkman’s Sunshine in My Throat, and Meaney’s The Ceibas Cycle – glitches are understood as tactical actions that expand and test the boundaries of the systems they are subverting. 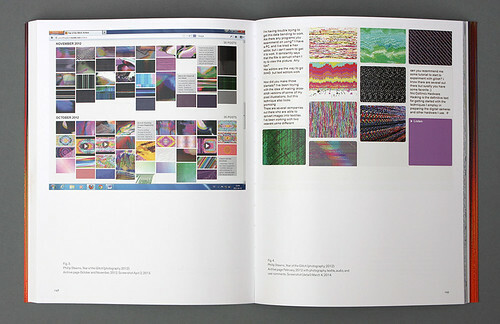 Each of these remarkable websites is a distinct place, where the glitched surfaces of the interface provide texture to the experience of navigating the content posted online; in Stearns’s case, this engagement with texture extends to the physical warp and weft of his Glitched Textiles. Central to Grundell’s study is the role of photography as source material for glitching and what can be learned from the different approaches and processes used by Stearns, Menkman and Meaney. 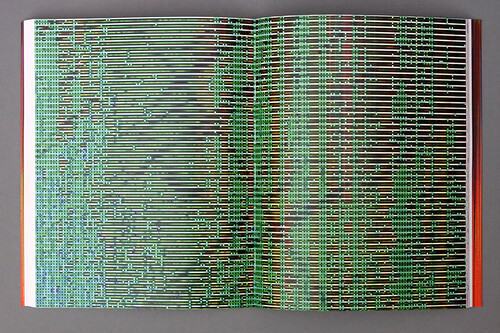 Spread showing Stearns’s Year of the Glitch nos. 24 (left) and 12 (right). 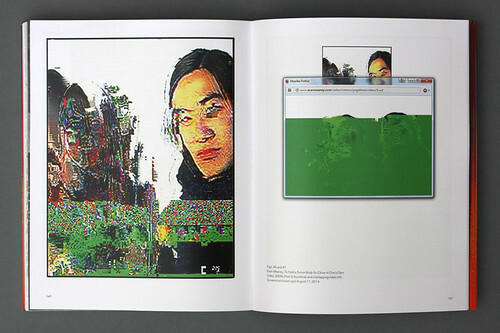 Year of the Glitch was a 2012 project in which Stearns posted approximately one glitch work per day to his Tumblr blog (see ‘Unexpected beauty’ on the Eye blog). Grundell’s analysis focuses upon the structures and systems challenged by glitched photography and specifically upon Stearns’s ‘DCP Series’: ‘a collection of digital images produced by intentionally corrupting the circuitry of various Kodak DC series low-resolution cameras’. 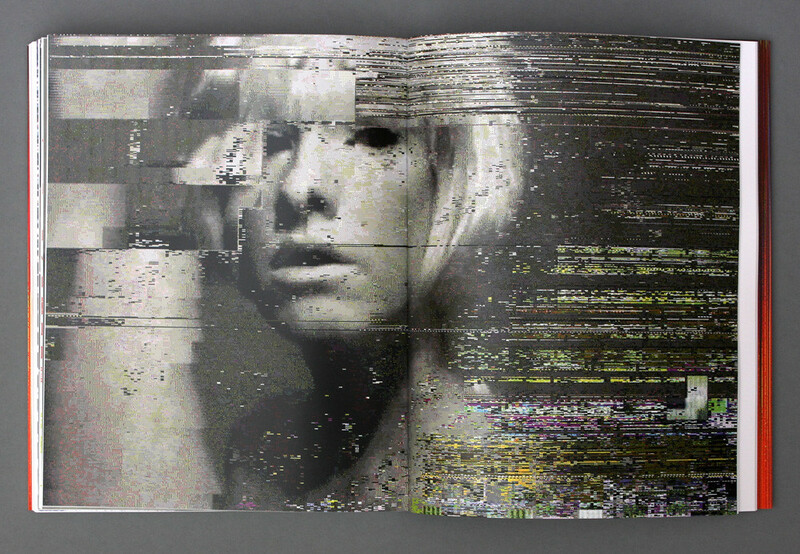 Accompanying many of the glitched images on Tumblr are short commentaries about processes and methods, allowing Stearns to share information about how a particular visual effect was created. These include a mixture of technical details (educational and instructional content for others to learn from), theoretical and philosophical ideas (such as the digital image as a kind of ‘veil’ or ‘layer’ between the camera user and reality) and culturally-inspired playful thinking (like the ‘Insta-Richter’ effect, a digital effect reminiscent of a Gerhard Richter squeegee abstraction). Spread showing Rosa Menkman’s Sunshine in My Throat, no date. 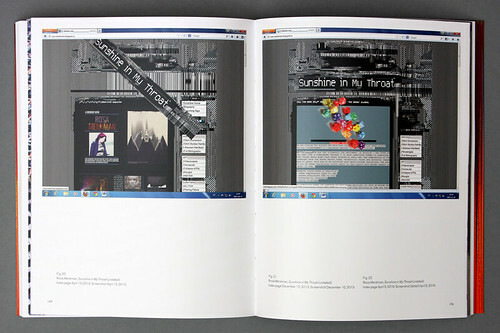 The title of Menkman’s Sunshine in My Throat, which was launched in 2004, is inspired by a line from Donna Harraway’s 1984 work A Cyborg Manifesto: ‘Our best machines are made of sunshine; they are all light and clean because they are nothing but signals, electromagnetic waves, a section of a spectrum, and these machines are eminently portable, mobile – a matter of immense human pain’. As a channel used to communicate some of Menkman’s glitched artworks, Grendell finds in Sunshine in My Throat a meeting point between human corporeality and computer materials. The viewer is drawn into the predominantly black and white presentation of the interface through erratic and errant trajectories, pixelated forms, flickering movements, dissolving text and a visual structure that changes in reaction to the passing cursor. Interaction with the screen sparks unexpected and accidentally initiated responses, such as windows moving or halting, bold colours appearing, and segments of the screen rolling, turning and sliding away. The apparent instability of the interface is both a theme and a means of connection. The uncanny and the unpredictable, which can become more familiar over time, become a mode of engagement by driving curiosity. Spread showing Menkman’s A Vernacular of File Formats: A Guide to Databend Compression Design, 2010. Menkman describes herself as an artist, theorist, curator, educator, researcher and organiser with all these intersecting roles presented within Sunshine in My Throat. The blog offers a lateral and interconnected repository of ideas, explorations, projects, manifestos, news, dialogues and technical guidance that is captivating and disorientating at the same time. Grundell focuses particularly upon the short film Compress Process from the Videoscapes section to explore bodiliness as both absence and presence. Compress Process is created from a Skype video of Menkman jumping around. It is a form of self-portrait that has been compressed in three different, glitchy, ways resulting in pixelation and unstable colours (which presents as black and white on Windows); bleeding effects in the more ‘messed up’ parts of the video; and a graininess to the images, which can appear like a collage of layers rather than a fluid series of frames. The result is both mesmerising and haunting. Compress Process has a distinct sense of bodily presence, yet the abstracted body on screen is physically absent even while feeling profoundly integrated with the digital interface. Images from Evan Meaney’s To Hold a Future Body So Close to One’s Own (video), 2009. Meaney’s The Ceibas Cycle is a multi-media installation, inspired by aspects of the Central American myth of the Ceibas tree, which began in 2007 and uses a glitching process to explore themes of translation, allegory and impermanence. For the Mayans, the Ceibas tree is the point of connection between this world and the next. Souls can travel up the tree branches to the sky or down into the roots and soil or – if entwined with another in life – the soul waits for its partner soul to arrive before continuing its journey. Over a ten-part series of instalments, Meaney alters digital video files (understood as codified memories of a visual language) through the application of colloquial language, causing the files to rapidly decay and ‘die’: a means of rearticulating the allegorical Ceibas tree story in a digital era. The files are stored online as part of The Ceibas Cycle, waiting to be found by someone who might then continue on to the next stage of their journey, touched by the digital soul of that glitched memory. Within the ten stages of the cycle, Grundell focusses particularly upon the video works To Hold a Future Body so Close to One’s Own and The Unseeable Exchange of Our Parts, as well as selected screen images from the cycle and a photographic Portfolio from Meaney’s website. Where Stearns’s work presents a visual narrative, made accessible through the chronological format of Tumblr, and Menkman’s work plays with temporality and bodiliness, Grundell considers Meaney’s work to blend selected aspects of these themes together. The Ceibas Cycle is neither embedded in an established form nor does it ostentatiously subvert the blog format. Instead, for Grundell, it is characterised by the concept of ‘sharing an unstable photograph’ and an approach that explores the values of ‘coherence’ and ‘splicing’. 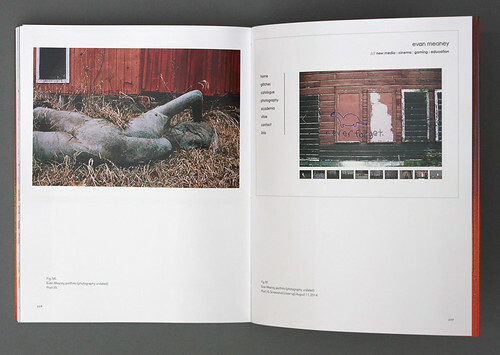 Spread showing Grundell’s screenshots of Evan Meaney’s photography portfolio, taken in 2014. To Hold a Future Body so Close to One’s Own is a ‘file and flesh based’ installation of hacked video files that offers twenty-seven channels, each with its own ‘cyborgian portrait’. Reminiscent of Warhol’s screen tests, these memories of people record the presence of absence that can be captured in video. 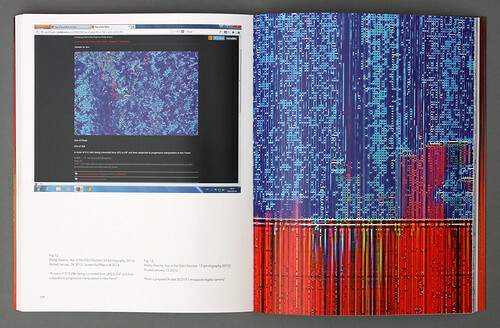 These visual records, which are in colour and silent, break down through the glitching process. The Unseeable Exchange of Our Parts is a short film, presented as a diptych, which extends glitching to include everyday experiences. A soundtrack runs with recorded street sounds, using a voicemail to show how the glitch is now an established part of everyday communication. As Grundell observes, temporal and spatial distances are traversed in short-cuts and shaky lapses mirrored in the scratchy sound. So much is potentially unfolding, yet the meaning remains obscure. 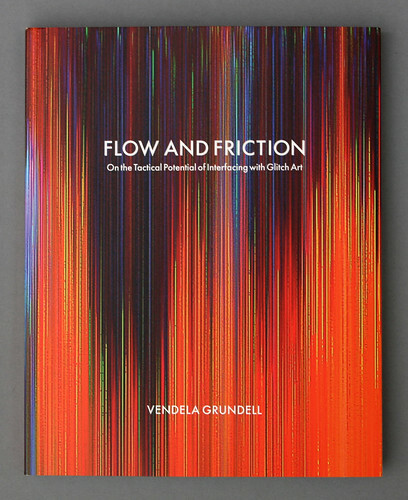 In Flow and Friction, Grundell presents a rigorous thesis – developed from an art historical perspective and rich with theoretical sources – about the ways in which the glitch can open our eyes to becoming self-reflective tactical viewers. The case studies use close analysis to record both general and specific responses, acknowledging the subjective and objective overlaps necessary to interpretation. Grundell’s conclusion suggests any encounter with a glitched interface presents the user with a deconstructive act, disrupting and revealing the otherwise overlooked systems that generate the phenomenological flow of online digital experiences. Flow and Friction, Art and Theory Publishing, €28. Book design: Patric Leo.